How many threads here at Rokslide start with “What pack/frame should I get?”, “First time out West…” or “What tent/tarp/bag/boot/quilt will work best for me”? I stopped counting at 100 just in 2018. 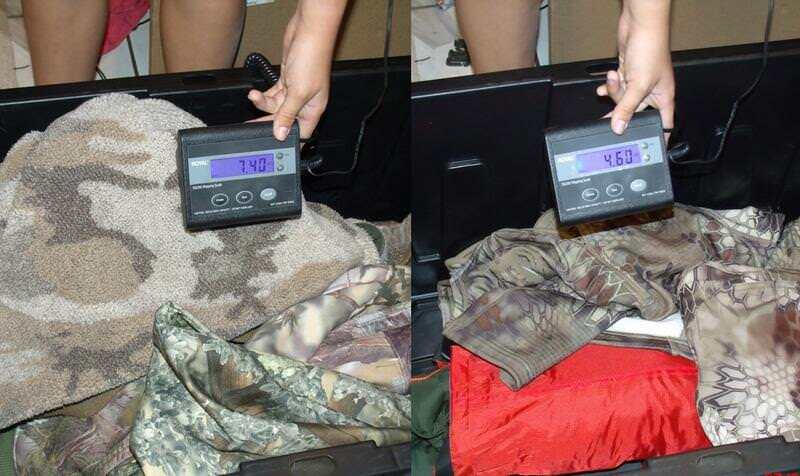 Improvements in hunting gear is not new so why the huge uptick in interest? Easy: hunters are changing their methods and locations and in the process of reaching outside their traditional locations and comfort zones are facing the realities that their usual gear might not be up to the next task. I am guiltier than most, even as a Colorado native. 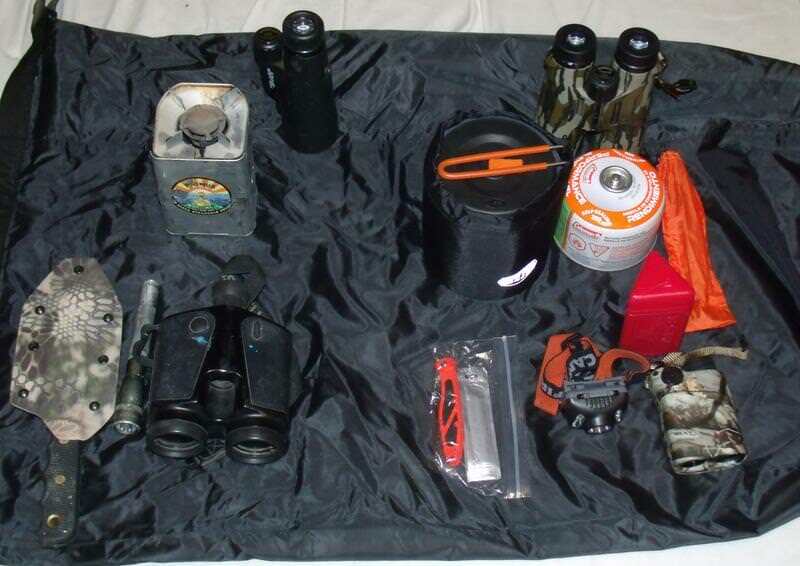 From 1990 – 2010 I hunted with essentially the same base gear, see photo above. My freezer was usually full and I was complacent; I was also ignorant and didn’t know just how much I really didn’t know. Below I will detail some of the major steps I have made in a year-long process of acquiring backcountry gear on a limited budget without breaking the bank. 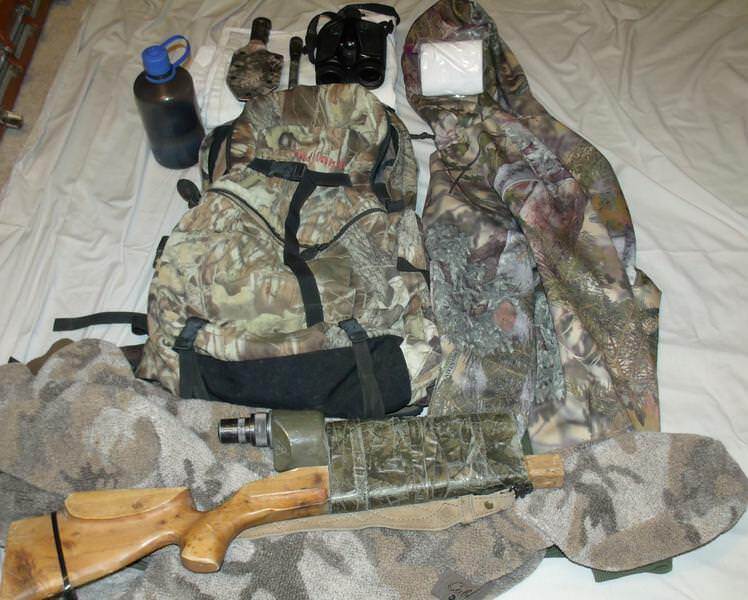 All my hunting gear must serve several purposes throughout the year whether it is fishing, ATV riding, camping, scouting, or hunting. We are the typical middle-class family with a tight budget. But, hunting and the outdoors is what keeps me going so my gear must hold up to constant use and perform when in the field. In 2010 I began hunting a new elk unit in central Colorado with a new hunting partner. It is here this story of a need to upgrade equipment begins. We’ll just call the area Kay’s Canyon for this article. 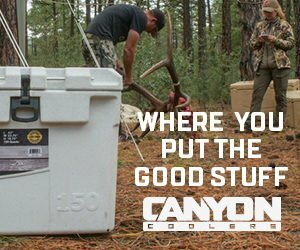 We hunted from a base camp where we each had our small camp trailers, and hunted two to four miles back up Kay’s for full-day hunts starting at 8,000’ and ending at 10,000’ every day. I learned a lot that first trip up Kay’s. The custom logger boots that worked just peachy when cruising timber or hunting in the prairie, were horribly heavy and uncomfortable for the three-mile steep sidehill hike up into the dark timbered north slopes of Kay’s Canyon. My daypack which served many years as a good pack for ½ day still-hunts and stand hunting in the prairie and pinyons, was uncomfortable with a full loadout of day-gear for this higher elevation fall hunt. My gear, by forced necessity, “worked” but was just not “right” for this hunt. The next year, 2011, my hunting partner and I decided to go muzzleloader hunting in the same unit. Same hunting strategy, just a month earlier. I already had a muzzleloader so I turned my attention to my other gear. Off to the big box outdoor stores I went with adequate, though restrictive, permissions from my wife to buy some new boots (Danner Pronghorns) and a pack (Eberlestock LoDrag) better suited to full day hunts and occasional meat packing. 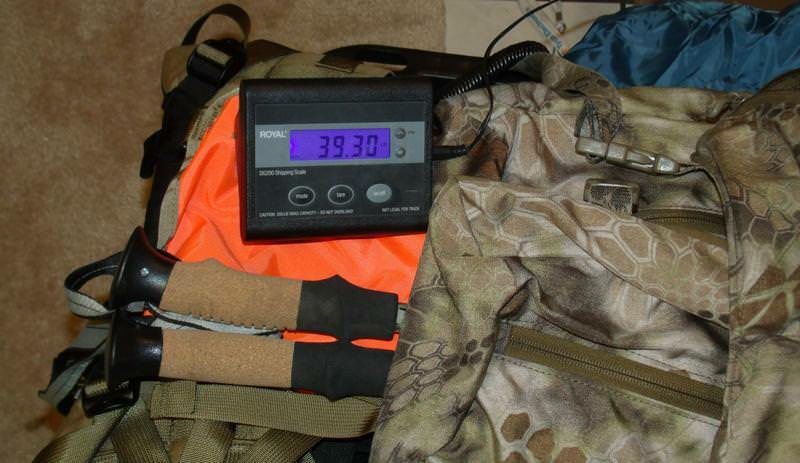 That new gear served me well for six years day hunting that high elevation area elk area and deer/antelope among the pinyons and plains of Colorado. Then in 2018, we decided to plan a venture into the Colorado backcountry on a five-to-seven day backpack archery elk hunt (Kay’s had succumbed to great hunting pressure). We scouted the new area and were ecstatic with what we found. 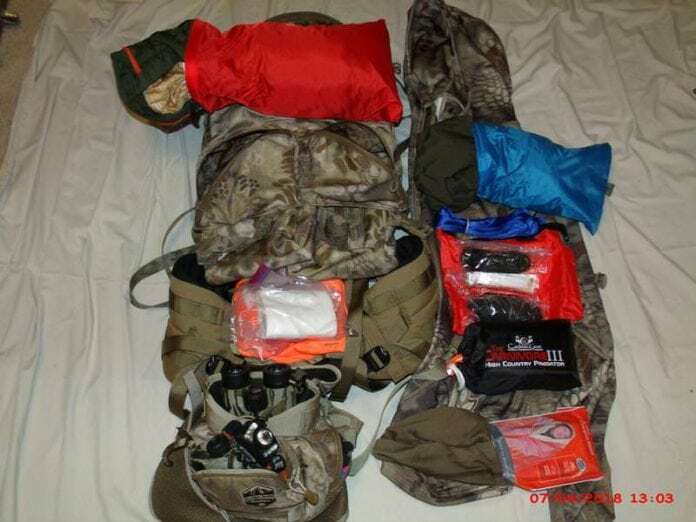 But another gear rendition was warranted for this new style of hunting and a lot had changed in the 35 years since I strapped a frame pack on my back with a few cans of stew and stayed overnight. What the end goal is. The first step was taking inventory of what I had now. Using the gear lists from multiple Rokslide threads and other sites, I began laying out what I currently had that fit the task ahead. I found that everything—the 1980’s Coleman Peak 1 composite frame backpack, the 1990’s Bushnell rangefinder, Slumberjack Quallofil 0* bag from 1984, cotton thermals, cotton full-body canvas game bag, Knives of Alaska camp knife, the heavy Cabela’s coat—was fully functional but much heavier than it needed to be, not to mention a decade out of date. Also, some items I just did not have: water purification (other than tablets), a cooking set, quarter bags, a pre-1960’s stove, and a tent (other than a nine-lb Walmart tent my daughters used for slumber parties) being just a few such items. Total weight of this starting point in June 2017: 54+ lbs! And this without weapon, cooking pot, water purification, or food. Starting the summer of 2017, I began acquiring the pieces to make my 2018 backcountry elk hunt happen. Most of the gear has been extensively used and tested during the elk, deer, antelope, and small game hunts of 2017 (and this year in numerous spring and summer scouting adventures.) Acquisition of a pack that would work and was affordable was first and foremost, quickly followed by a tent and sleep system that weighed less than 10lbs, and finally clothing upgrades. Careful attention to Camofire, Rokslide, and Amazon led to a steady stream of smaller purchases to round out miscellaneous equipment upgrades between June and September 2017. I knew I could not afford to do everything at once. And honestly, backcountry hunting was planned just for my elk hunting as my deer and antelope hunting areas are more in the prairie. I was “that guy” we see often in the forums who was doing things on a tight budget to survive a week in the backcountry plus scouting trips. 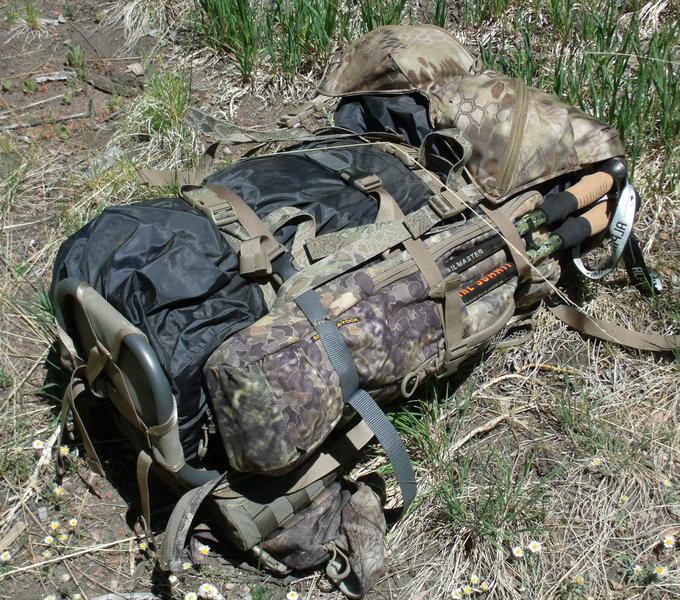 An Eberlestock Mainframe with Batwings and a Kifaru OGL initially replaced the Coleman Peak 1 (see loaded pack below). The Mainframe was a very early purchase and also replaced my old Badlands and Eberlestock LoDrag bag I used for my day hunts. For me there is a huge value in having one pack that stays loaded with basics and performs well in multiple hunting methods. Some hard scrimping and unexpected side jobs this spring allowed for the purchase of a Kifaru Nomad 2 and Duplex Lite. This is the only “premier” piece of gear in my kit so far and my love for the versatile batwing design drove my choice of pack/frame. The 1960s Primus white gas stove was replaced with a MSR isobutane burner I was able to pick up at a local estate sale for $15. I had nothing suitable for a cooking pot so I went with the GSI cookset for two, since my daughter often accompanies me on trips in the woods. In the future, a Jetboil/Windburner type setup will likely be incorporated as a “premium” upgrade. I opted for an inexpensive small backpacking single mantle lantern also. It has worked well to take the chill off in the mornings when lit in the vestibule. A Micron will be a future upgrade. A difference of four pounds was realized in upgrading my sleep system, and for less than $200! The 4P Walmart dome tent was returned to daughter-use when I found an Eureka Midori 2 on sale for $60. Future shelter replacement includes a tarp of some fashion and a lightweight bivy or nest for inside. Having spent years in a wall tent I know all about bugs and critters running across my face at night and either a tarp with a nest or a bivy is a must for me. My Slumberjack, heavy and almost worn out, is a great bag and has spent well over a thousand nights in the woods. I found a Kelty 20* bag on sale on an Amazon deal for $60. I sleep cold so I added Army surplus goretex bivy for $35 to add a few degrees comfort for me. 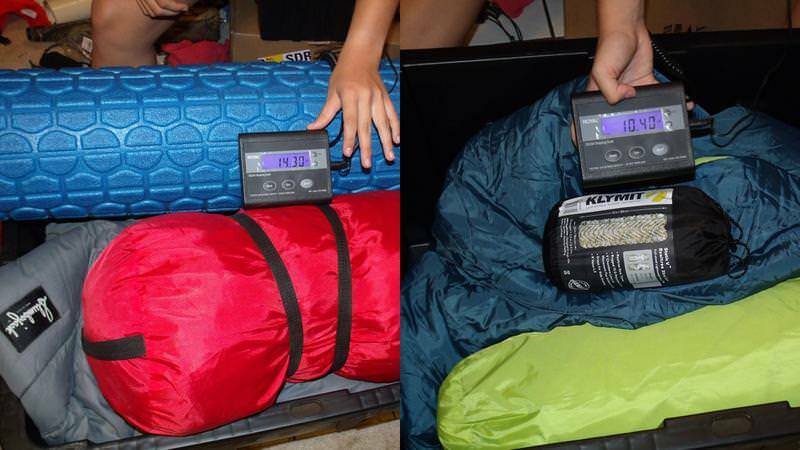 Camofire had a sale on Klymit sleeping pads and that rounded out my thrifty sleep system. Next year I plan on upgrading to an insulated pad and a 0* Western Mountaineering, Marmot, or Kifaru bag. I have not been cold in the Kelty (so far) but I want true four-season versatility in the future. Rain and snow wasn’t much of an issue for my complacent gear given where I hunt, but extreme temperature ranges in the day are. I traditionally relied on a heavy insulated fleece Cabelas coat, cotton thermals, camo Walmart jeans, and a heavy King’s Camo sweatshirt. These have been replaced with a dark green Columbia puffy jacket (on sale from Kohl’s for $25), lightweight dark green rain jacket (Sam’s Club, $15), merino thermals, and Kryptek Ragnar pants and Sherpa hoodie. I’m still wrapping my head around how something as lightweight as the Sherpa can be so durable and warm and merino base layers are not scratchy. In coming seasons I will be looking out for great buys of the premium brand clothing choices (First Lite/Sitka/etc.). I shaved three more pounds just on better clothing choices. My 2017 gear layout reflects these many changes as seen in the photo above, with the Mainframe. Nothing here is a premier item, but all are serviceable and worked well for my latest fall and spring seasons. In time, each can be replaced with better/lighter/premium pieces as I further define what fits my hunting area and methods. Between 2017 and today I have changed little except for a new AGC bino harness to replace the Nosegunner and I have replaced the Mainframe with the Kifaru Nomad 2. 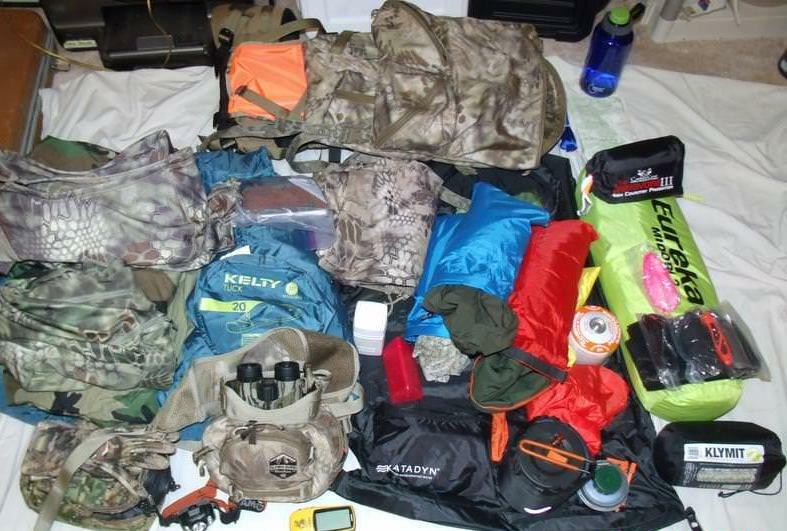 The photo below shows final weight of what will be going to the mountain this year as a final loadout minus food, including 1L of water. 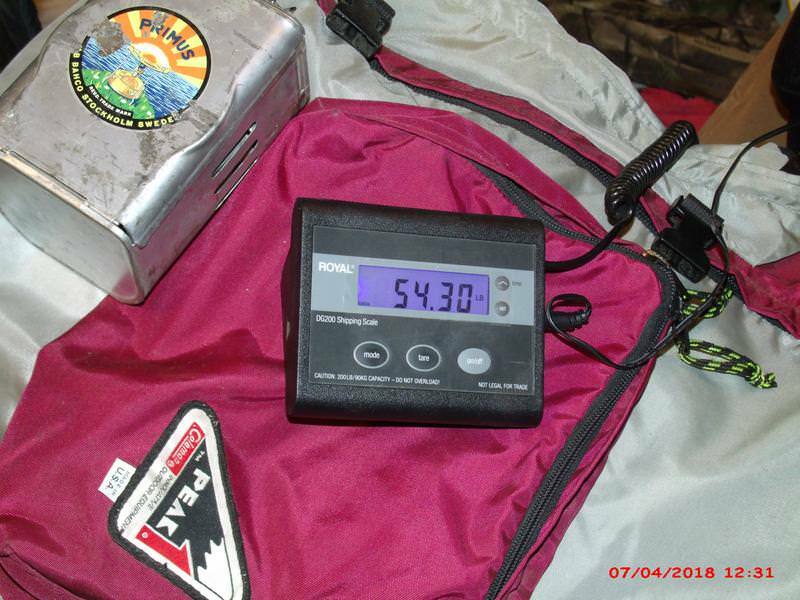 Well over 15lbs weight difference as my initial 54lbs loadout weight does not include stove fuel, purification, or cooking pot. I anticipate dropping another 10lbs next year with the acquisition of the aforementioned select high tier products – but this is doable! The choices of my equipment reflect the desired form/function of the specific product, not necessarily a definitive brand choice in a specific item; price points and comparative shopping dictate the final choices for me. “Buy once, cry once” is a popular chant in some of the forums and there is certainly wisdom in that. However, as a blue-collar family guy, such extravagant thinking would be quickly quashed by the wife and having built my dog’s doghouse, I was not keen on making that my new residence. As an added benefit, as I have also created a great starter-kit for my 12-year old daughter, who is my all-around outdoors buddy, and soon to be a partner in big game pursuits. Instead of a legacy of antique equipment designed before she was even born, she will be starting with some mid-tier serviceable gear that she can modify and replace over time to fit her exact needs. Replacement of the “little things” adds up also. Swapping a KOA Camp Knife for a Havalon shed a pound right there. Headlamps are much lighter than AA Maglites. 1.9mm cord is a fraction of the weight of ¼” nylon rope or 550 paracord. Merino/synthetic gloves are neglibible compared to leather gloves. I spent a lot of time eliminating duplicates in my gear and streamlining what I take. Easily, another five pounds was saved in the “little things”. Another thing I never really considered is how well the “new gear” has served me in my traditional hunts, outside of Kay’s Canyon, on the plains and foothills. My daypack weight has been nearly cut in half and increased in overall serviceability. On the downhill side of some health issues over the last 10 years, I am now able to take advantage of this lighter daypack weight and go places that I may have hesitated before. 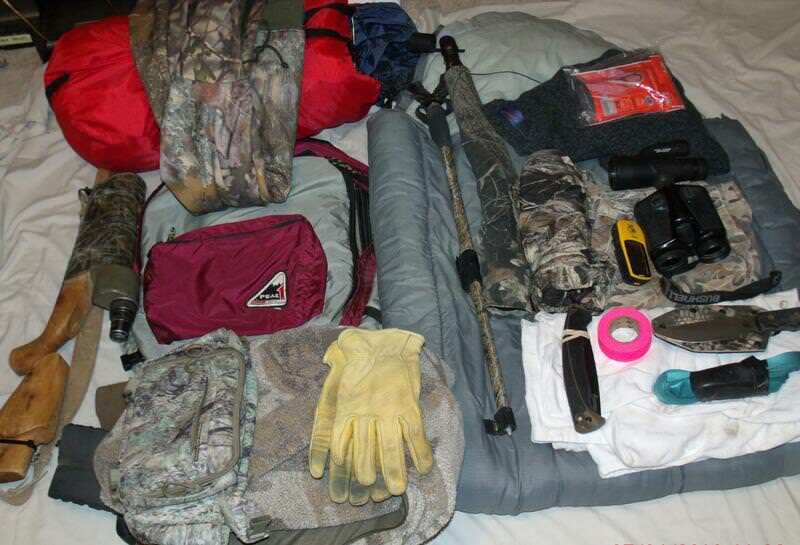 Packing game, which I have done my share of, is now a viable option (instead of a dreaded last resort) and easily quadruples my effective hunting areas in the plains and foothills where I hunt from a base camp. 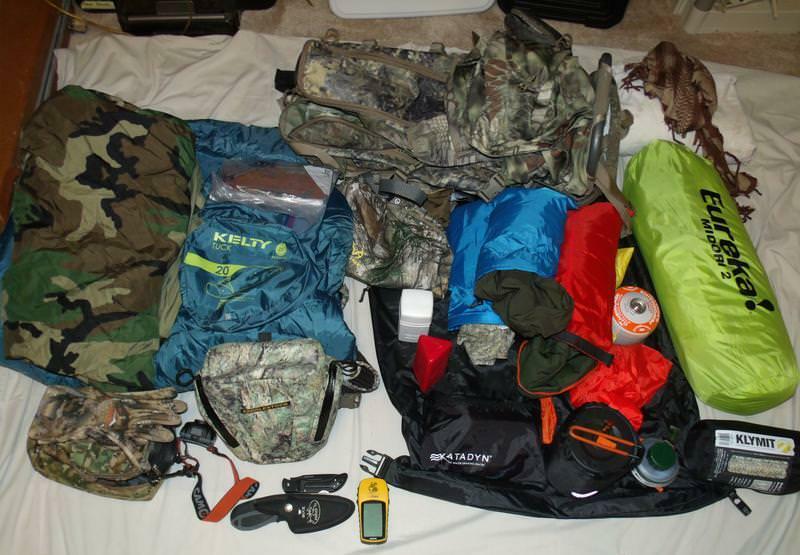 Comparing my pre-2010 and current daypack loadout shows that great strides have been made. I anticipate moving into some quality glass eventually. I am excited to see many of the reviews of the “mid-grade” glass coming in speaking highly of bino/spotter options that cost less than a house payment. New glass will come after a new shelter+bag next year. So you see, it is doable to have a capable outfit starting “from scratch” on a tight budget. There is a weight penalty when going mid-tier on many items. But, using the mid-tier items has helped me define what I really need to invest in, and not just what is being recommended by others. I feel like I’m moving from complacent to competent in all my gear. You can ask Chas questions or discuss this article here.